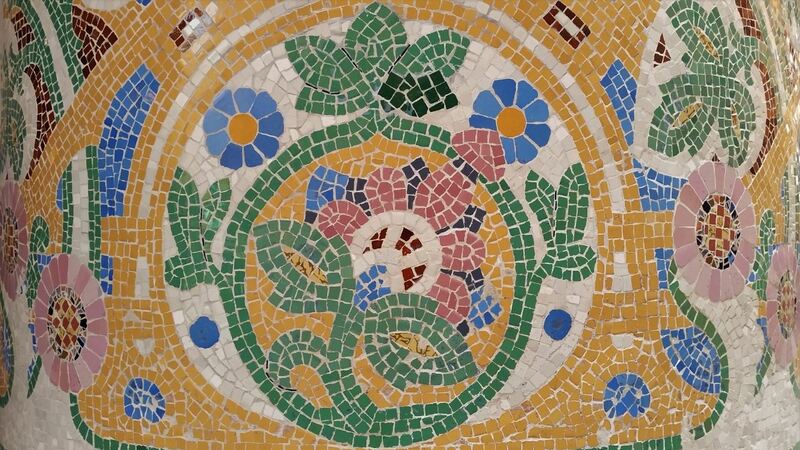 We can vividly recall our first visit to Barcelona years ago. Carrying a backpack loaded with things to do and places to see we were strolling through the narrow streets of the Sant Pere neighbourhood when we suddenly found ourselves in front of The Palau de la Música Catalana, one of the most beautiful buildings in Barcelona. We wanted to go inside but unfortunately all the tours for that day were sold out. 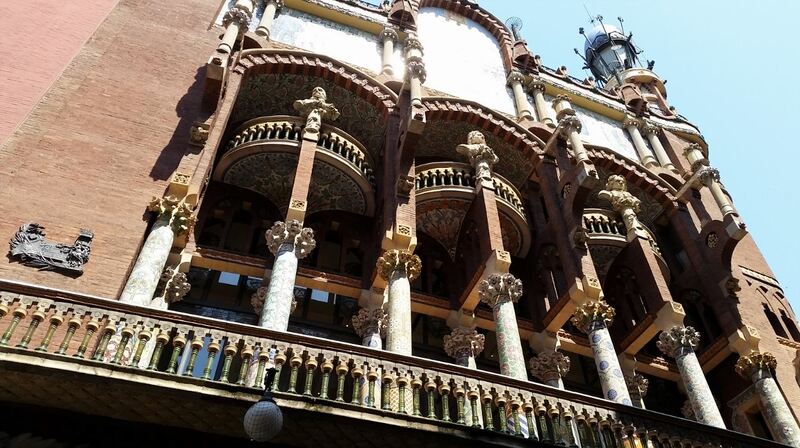 Since then a visit to the Palau de la Música Catalana has always been on our to-do list when visiting Barcelona but for some reason we never went back. 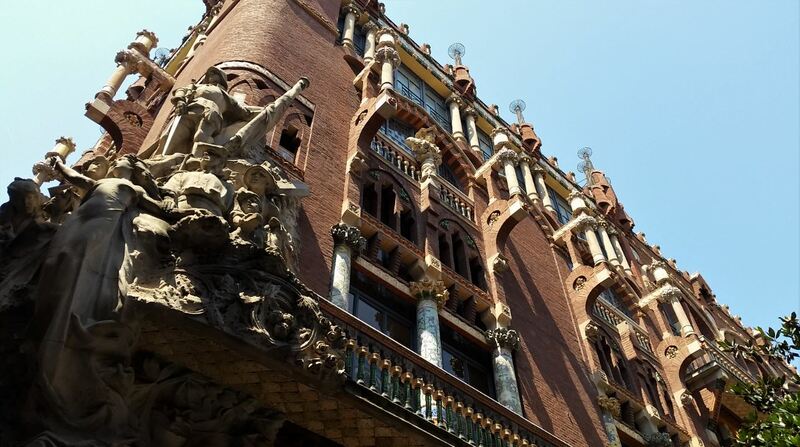 Last week when we were in Barcelona to visit Holland America’s refurbished Westerdam we decided to finally visit the Palace of Catalan Music. The Palau de la Música Catalana was built between 1905 and 1908 by architect Lluís Domènech i Montaner as a home for the Orfeó Català choral society. On the outside that musical box is constructed in red brick decorated with ceramic tiles, mosaic pillars and other decorative elements. On the right side corner of the building a large group of sculptures by Miquel Blay depicts “La cançó popular Catalana” (The Catalan Folk Song). In the center a female figure, representing the Catalan song, is surrounded by characters of different social classes: children, peasants, sailors. Above her stands Sant Jordi, the patron saint of Barcelona, holding his sword, protecting her and the other sculptures. The sculpture is said to show that people of all classes can enjoy the traditional Catalan music and the Palau is for everyone’s enjoyment. Inside the Palau, the Concert Auditorium is dominated by the organ over the stage and the central skylight which portrays the sun and fills the auditorium with natural light. On the left side the stage is decorated with a bust of Anselm Clavé (the father of modern Catalan music) and Beethoven on the right while nature motifs, including flowers, palms and fruits hang above them. The back of the stage is decorated with 18 muses carrying a musical instrument and a Catalan flag in the center. Adjacent to the Palau is the Petit Palau, a modern extension which opened in 2004, with an auditorium for chamber music or small-format concerts. The brick building is marked by a palmtree in its facade. Standing in front of the Petit Palau is a statue by Jaume Plensa. Entitled “La Carmela” it shows the 3-dimensional head of a girl. 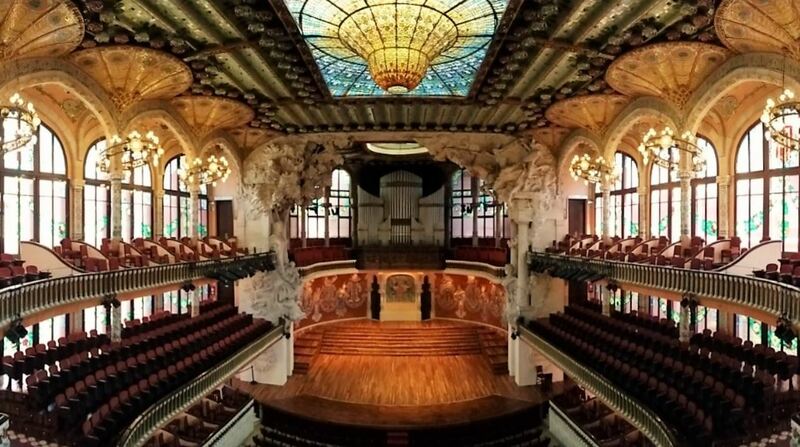 The Palau de la Música Catalana is considered an architectural jewel of Catalan Art Nouveau and as such is listed as a World Heritage Site by UNESCO since 1997. 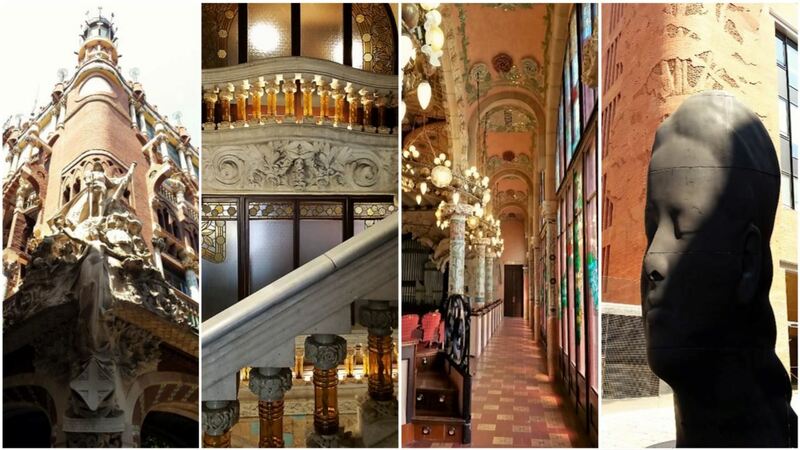 The Palau is located at C/ Palau de la Música, 4-6 and is open every day. Guided tours are available in Catalan, Spanish, French, Italian and English and start every 30 minutes. For more information and tickets visit www.palaumusica.cat. It’s amazing how few visitors to Barcelona don’t know about Lluis Domenéch i Montaner. 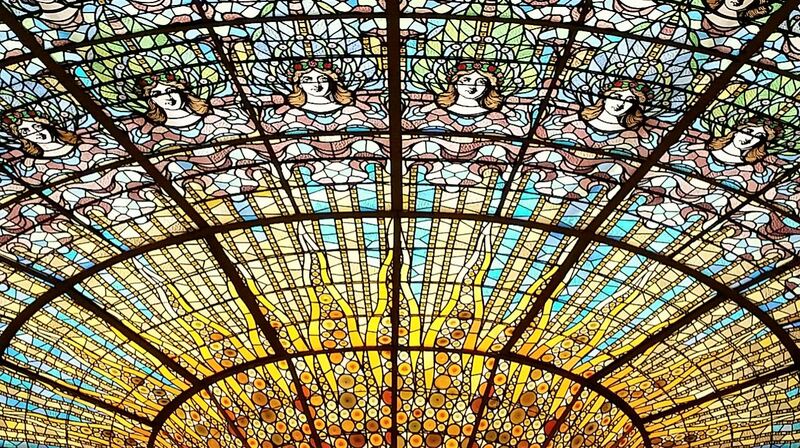 So, if you’re visiting Barcelona, please make sure The Palau de la Música Catalana is on your to-do list. When we first laid eyes on it, we were mesmerised by its beauty and colour. It’s so good we’ve visited on twice, on different visits to Barcelona.